Cool. I hope to see teams like Niue, Tokelau and Wallis and Futuna. Maybe Kiribati? victorsra wrote: Cool. I hope to see teams like Niue, Tokelau and Wallis and Futuna. Maybe Kiribati? These 7s tournaments are for club teams, I believe. Could be great for Oceania rugby in general. There was talk of Rugby League doing something similar a while back. "Sorry to say it won’t be happening this year due to other commitments happening on the same month, mainly referring to the Oceania 7s rugby to be held in Fiji. There are talks that World Rugby and Oceania Rugby are trying to get the tier 3 nations playing next year. Will see and keep everyone updated." Might be a bit hopeful but maybe we could see an Oceania Cup with more than 2 teams? Apparently already "inquiries from World Rugby" about adding Samoan and/or Tongan teams to the NRC. Immenso wrote: Apparently already "inquiries from World Rugby" about adding Samoan and/or Tongan teams to the NRC. Will likely be a Samoan side considering recent developments but I would support one of each. The Drua have been a revelation in the competition and have added so, so much. Would love to see more PI involvement. "Fiji's Super Rugby hopes fade as SANZAAR push World League"
“This is a pathway for these players to move up to the Fiji Drua, Fiji Warriors and to the Flying Fijians. It is a good incentive for the Vodafone Vanua Championship teams. Immenso wrote: "Fiji's Super Rugby hopes fade as SANZAAR push World League"
Not surprising. But they will be one of the mooted World Series Rugby teams so they'll still have opportunities present. A Fijian team at the World Series Rugby could be an improvement over the Fijian Drua at the Australian NRC. But it would still be a development team, not a test player team like the Jaguares. NaBUru38 wrote: A Fijian team at the World Series Rugby could be an improvement over the Fijian Drua at the Australian NRC. But it would still be a development team, not a test player team like the Jaguares. It would be a full time squad playing in a professional competition that will help feed the national team. Exactly what a team in SR would have done. It was never going to be the sole source of talent for the Fijian national team. But it will help. Toulouse have set up a partnership with a New Caledonian club and already brought over a number of players. The concept had merit. I remember them playing New Zealand, Australia and South Africa one year during each teams bye week in the Tri-Nations and were pretty competitive. I think the main issue was the team itself. From memory apart from the financial viability of the team, there were rumours the Pacific unions had trouble working together. The Rapa Nui 2018 sevens tournament was played last weekend. 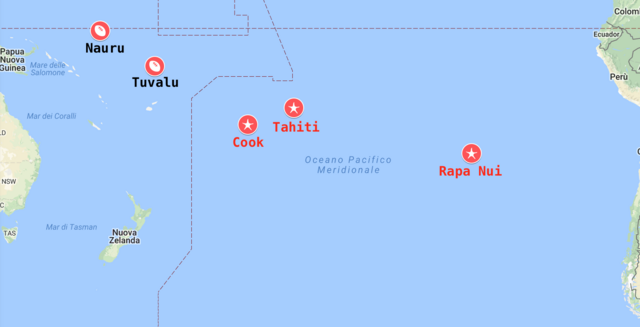 There were teams from Tahiti, Rapa nui and continental Chile. This tournament was created 4 years ago in order to incentive the practice of Rugby in Rapa-nui. The 2018 champion was Coyotes (from Antofagasta, Chile) which defeated Faa´a (from Tahiti) by 26-5. The third place was for the local Matamu´a Rapa nui which defeated Papeete (also from Tahiti) 33 to 21 in a very disputed game. This was the 4th. version of the tournament which is linked to the Papeete international sevens. I hope this event will grow in order to convocate representatives of other islands. American Samoa broke the barrier of 200 weeks at the bottom of the World Ranking. At the end of the year (monday december 31), if nothing unexpected happens (like points penalization of some team), they will have been at the end of the ranking for 209 weeks in a row, id est since four years ago. There are similar stories of Uruguayan ex footballers. I noticed that in Oceania Rugby website the Tournaments sector doesn't include anymore a "Oceania Cup" section, which I'm sure was present until few weeks ago. Could this mean that the Oceania Cup, played in the last edition (2017) by just two nations, has been disbanded? Yeah why bother to play anyways? Oceania rugby provides a link to its tournaments on World Rugby page, why put news on their site. Because you know "The Gold Standard Sport in Oceania" deserves best. The Oceania Cup will be hosted by Papua Guinea from august 27 to september 8.